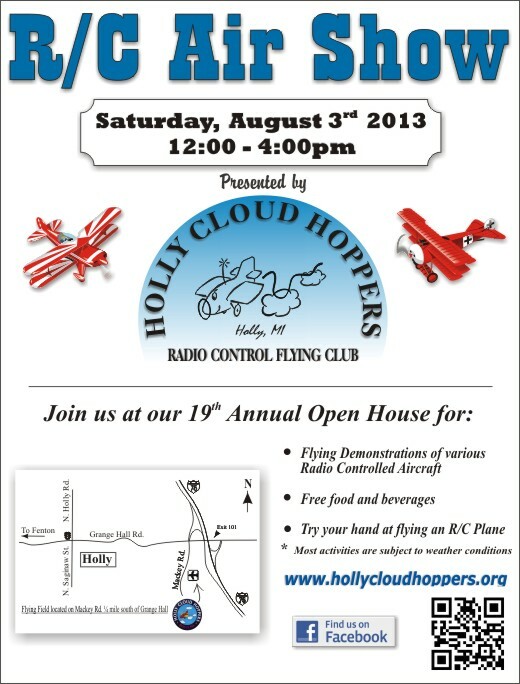 With just a few days until the HCH Open House, things are shaping up quite nicely for our biggest event of the year. First, the weather report is showing we should expect great conditions for a day of flying. Second; a large group of glider pilots from the Greater Detroit Soaring and Hiking Society Club have agreed to come and put on a discus launch glider (DLG) demonstration. These pilots will fly an actual DLG contest round, which last about 10 minutes. The event will be MC’ed explaining to the crowd how the event works and what is happening while it is happening. Each pilot will also invite a spectator to be their timer for the event, giving a few lucky people a chance to be live participants. If you’ve never seen a discus launch contest in action you are in for a treat. It can be chaotic, graceful and breath-taking all at once. You don’t want to miss this one. Third; we have a couple more maybes that if these people are able to make it to our event they will certainly add an element of coolness that most will not soon forget. I’d certainly like to explain a little further but until we get a firm commitment, those details will just have to remain a secret. Fourth; guess there really isn’t a fourth that I can think of at this point other than 2013 Open House should go down as one of the better Open Houses in HCH history. Hope to see you there. If you have questions or need more info just leave it in the comment section below.